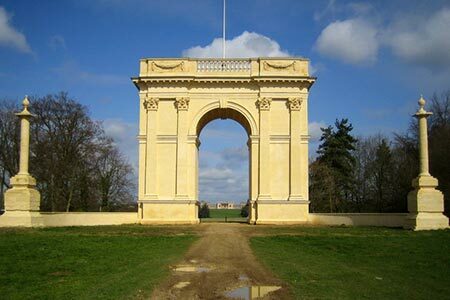 Buckinghamshire walk from the village of Chackmore follows the boundary of majestic Stowe Park where Capability Brown was first employed as head gardener. The paths used for this walk do not enter Stowe Park which is a National Trust property. However, you may wish to pay the admission to see the grounds close at hand. A GPX File is available for download (see walk description). The County of Buckinghamshire is noted for its open countryside and natural features, including the Chiltern Hills Area of Outstanding Natural Beauty which occupy the southern part of the County. Walks along the River Thames, through Wendover Woods and along the Ridgeway long-distance footpath are full of interest. With many attractive towns and villages, walking always offers variety. Walks can also be combined with one of the many historic houses in the area. The highest point in Buckinghamshire is Haddington Hill in Wendover Woods at 267 metres above sea level.